The Itzala awning blind reduces incoming heat significantly and stops the sun even before it hits the window pane. Itzala awning blinds are designed specifically for VELUX roof windows only. The Itzala blackout budget blind is the best low cost value option available for VELUX old generation roof windows only. It offers almost complete darkness and is very easy to use. The Itzala roller blind is a low cost option that fit VELUX, FAKRO, RoofLITE, Dakstra, Keylite and Dakea roof windows. The blind gives a softly diffused light effect and if you are looking for the lowest possible cost blind for your window, this is the blind to choose. Itzala venetian blinds fit VELUX, FAKRO, Dakstra, RoofLITE, Keylite and Dakea roof windows. It is the look that leading designers and stylists always return to - the classic venetian blind - and this time at a very low price. A great value blind. Itzala branded blinds are low cost blinds that fit VELUX, FAKRO, RoofLITE, Dakstra, Keylite and Dakea roof windows. You can choose between 3 different manuallly operated blind types and a manually operated awning that fit VELUX, FAKRO and RoofLITE roof windows. The more narrow range of blinds, colours and operation types allow us to manufacture in bulk and thereby keep prices down - we never compromise on quality to do so. In other words, if you are looking to buy a top quality blind for less, Itzala branded blinds are for you. The VELUX blackout blind is ideal for bedrooms, giving 100% blackout 24/7. The blind is made of dirt-resistant polyester with a special heat blocking aluminium coating on the back to retain heat in the room in winter and reflect solar heat in summer. Runs in close-fitting profiles to ensure effective light exclusion. The VELUX classic blackout blind is ideal for bedrooms, giving an essential blackout effect. The blind is great if you are looking for an original blackout blind in good quality and is a good choice for replacing old or worn blinds. Is suitable only for VELUX roof windows produced before 2013. 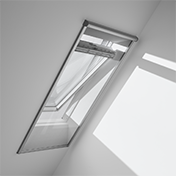 The VELUX awning blinds help to reduce the heat of the sun and also control the daylight coming into the room. The cloth is transparent and therefore allows full view when the awning blind is pulled down. While not in use the awning blind is discretely hidden in a top cover. Make your home more energy efficient with VELUX Blackout energy blinds. The blackout cloth with honeycomb structure and an aluminium coating inside improves the insulation effect of the window as well as the indoor climate all year round. The only blind that offers a view out, blackout, privacy, light and insulation - all in one. The flexible blackout blind! The VELUX insect screen keeps out all uninvited guests such as flies and insects whilst allowing you to enjoy fresh air from an open roof window. The insect screen can easily be combined with any type of a VELUX blind. The screen runs in friction less aluminium side profiles and is elegantly integrated in top casing when not in use. VELUX Venetian blinds offer great light control and are well suited for kitchens and bathrooms where humidity can be high. The blinds are easy to clean and the slats can be angled as you wish to regulate light. The blind operates smoothly in any roof pitch, even when the window is open. Our clearance blinds section consist of end of the line blinds from VELUX sold with a 50% discount compared to the original price. The blinds are all in perfect condition, but for some the packaging appears to have been in stock for some time. We offer both manually operated as well as electrically and solar powered, remote controlled clearance blinds. VELUX clearance blinds come in a limited number of colours depending on the blind type as well as your window type and size. We offer a wide range of genuine VELUX blinds for VELUX roof windows. VELUX is the world's largest manufacturer of roof windows and the quality of their products have made them one of the best known and most trusted brands in the construction industry. Blackout or roller, pleated, energy or venetian - whichever type of blind you choose you can be certain that is has been designed with supreme functionality and design in mind. Can I combine the insect screen with a VELUX blind? The VELUX insect screen can be combined with all VELUX interior blinds for additional light control. The insect screen can also be combined with VELUX awning blinds and roller shutters for additional heat protection. The VELUX insect screen is installed onto the interior wall, not directly onto the window. If you have another blind installed, you're free to roll it up and down and open and close your window as you like. If your window and/or blind is manually operated, the insect screen has to be rolled up when opening or closing the window. If you have an open centre-pivot window, we recommend that you lock the window in the open or closed position with the barrel bolts to avoid damage to the window or to insect screen. Is an insect screen the right solution for my room and needs? The VELUX insect screen keeps unwanted visitors such as flies and insects out, while allowing you to enjoy fresh air from an open roof window. The insect screen is installed directly onto the wall. It is made of a durable, transparent net that is easy to clean and doesn't block your view or incoming light. When not in use, the net is neatly stowed away in the sleek top casing. We recommend an insect screen for all rooms that you would like to keep well ventilated and insect free. What do I have to take into consideration when thinking of purchasing a VELUX insect screen? The main purpose of the VELUX insect screen is to keep all unwanted visitors such as flies and insects at bay while allowing you to enjoy fresh air from an open roof window. VELUX insect screens cover the whole window area and are made of a durable transparent net fabric that won't obstruct your view. As a result, there are two things to be aware of when choosing a VELUX insect screen. 1. You will need an additional blind if you want to control the amount of daylight coming in to your room. VELUX insect screens can easily be combined with a VELUX blind for daylight regulation. 2. The VELUX insect screen is installed onto the interior wall, not directly onto the window. When ordering an insect screen, measure the width of the window opening on the interior wall to find the correct size insect screen. Insect screens are available in various widths with the following three heights: 1600 mm, 2000 mm and 2400 mm. The height, but not the width, is adjustable. If you have a window with vertical elements, you will need two insect screens and an additional installation kit. Please note: In most cases you will need to cut the insect screen to match the size of your window opening. The VELUX insect screen is manually operated with the help of a control bar. Simply place your hand on the bar and pull it up or down. It is attached to a top casing and runs in side channels that ensure a smooth operation. When not in use, you stove the insect screen away in the top casing.